Around 2013, we were approached by some Elko County judges who were impressed with a site we built for the Sixth Judicial District Court here in Winnemucca. 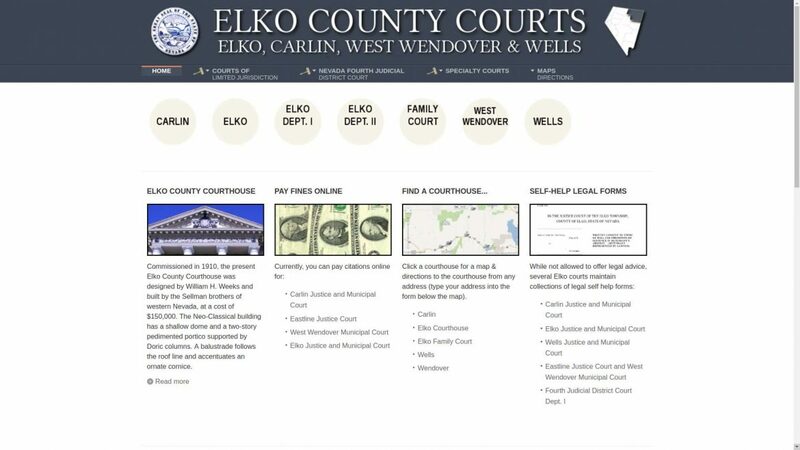 They asked us to put together a single website to serve as an information clearinghouse for all eight courts in Elko County, Nevada. It was a labor-intensive project initially, as we worked with a large group of clients to pull together all the media and information needed. After several weeks, we launched on Joomla 2.5. Distributing costs among the various courts helps keep costs low for Elko County taxpayers. We migrated to Joomla 3.x in 2017, and the site serves an impressively high volume of users. It features an advanced download manager that serves up the self-help legal forms preferred by each court, custom logo branding, judge bios, courthouse maps and photos, links to third-party ticket payment gateways, and SSL encryption for a handful of domain names that point to the site.